If you ever get confused about which one of these two is Mutt and which one is Junkyard, just ask yourself: which one is wearing the muzzle? Mutt is a natural with animals. He likes them and they like him. The problem is that he gets along better with dogs than he does with humans. He graduated Jungle Warfare Training School, and was attached as a cadre to Special Ops School and as an advisor to the Security and Enforcement Committee. He and his K-9 Junkyard have worked together so long, they no longer need to give each other audible or visual signals. It's almost as if they function as one organism. Qualified expert: M-16, M-14, M-1911A1 auto pistol and MAC-11. 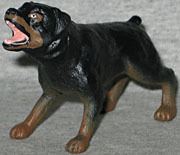 Back in 1984, Mutt was the first figure to be released with an animal sidekick - beating Timber and Polly to stores by a year, Junkyard was just the first of many. Who's a good boy? Junk's a good boy! Yes he is! Yes he is! Good Junk. Mutt is looking great in Generation 3. His brown and green uniform has gotten a nice update, with a separate vest worn over the Viper's torso. The vest has padded shoulders, a pocket over the heart, and a molded knife sheathed on the chest. His legs are new (they were used later for Lift-Ticket), but they really look like they're borrowed from someone else, judging by how poorly the hips integrate with the waist. Befitting a dog trainer, Mutt's wearing a thick, padded glove on his left arm - the bite-proof kind. 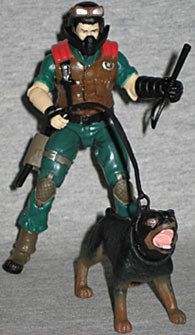 Like the classic figure, Mutt has a removable helmet and face mask. While the helmet is great, with his brown, silver-lensed goggles molded on the forehead, the mask is pretty much crap. It's too big by far, so it doesn't sit in place right on his face - there's a huge, noticable gap between his head and the now free-floating mask. It just hovers in space, apparently. That is a real disappointment. You could just do without it, I suppose: he hardly ever wore the thing on the old cartoon. Beneath his helmet, Mutt's not a very handsome guy. His hair is plastered against his head [what do you want, he wears a helmet all day long --ed.] and his mustache does nothing to draw attention away from his flat nose. His mouth is open slightly, hopefully giving Junkyard an order rather than just breathing through it. He's been painted with a large pink scar running down his left cheek - even worse than the one Xamot has. Mutt's other accessories include a MAC-11 submachine gun, and a simple black baton. The MAC-11 (which uses slightly smaller ammo than the MAC-10) is detailed nicely, with the stock folded and a relatively small magazine, as well as an extended shrouded barrel - not a silencer. The baton is smooth save for the hand grip, and features a loop molded at the end, intended to go over the user's wrist, but it's far too stiff for that. Junkyard is clearly a Rottweiler, rather than the generic "black dog" of the '80s, so this is a new sculpt, obviously - and an impressive one, at that! He's got sculpted fur, floppy ears, and even individual teeth in his mouth. Oh, and he's anatomically correct. Why do you think we were so confident in saying "he?" Heck, look at the bottom of his feet, and you'll see indivdual toepads. Aww! Junkyard's gotten a lot of attention, so he looks very nice. Just like the 1984 figure, Junkyard gets a brown paint app for his belly. Of course, because technology is better now, he also gets brown on his face, a pink mouth, white teeth and white in his eyes. Ignore the fact that you'd almost never see te whites of a dog's eyes - people would probably complain if his eyes were all-black (assuming the apps to do an appropriate super-dark brown would be too tough). The doggy even gets an accessory of his own: a leash and studded collar, molded as one. Prototype photos showed the collar being silver, but it's black on the final release. The collar slips over his head rather than having to clasp shut like the ones did, and the leash is flexible enough to have Mutt hold it. Why are we saying it's Junkyard's accessory and not Mutt's? Well, when you walk a dog, do you tell it to "put on your leash" or "put on my leash?" It's the dog's property, of course. Mutt and Junkyard are a nice pair of figures. The only real downside to this one are Mutt's ill-proportioned legs (a minor issue) and the fact that his mask isn't properly sized for the figure (a major one). But look past that, and you've got a winner. 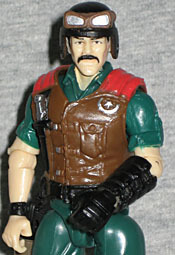 And if you picked up Flint in Cobra Disguise, try putting Mutt's head on that body, to re-create the episode.